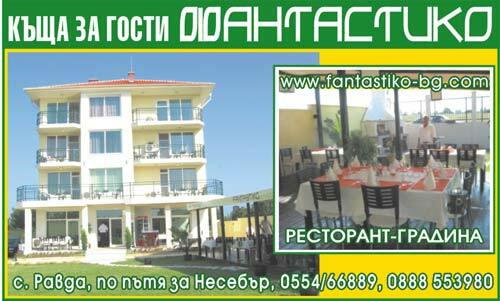 Guest House Fantastiko is located in a quiet palce in Ravda village, just five minutes walk away from the center and about 100 meters away from the sea coast. We offer double rooms, tripple rooms and apartments, each with its own terrace. All are furnished in modern style and are equipped with Air Conditioner, cable TV and mini bar. Very clean guest house, lovely people speaking English and German. Good and favourable food and drinks. Greatings from Germany.